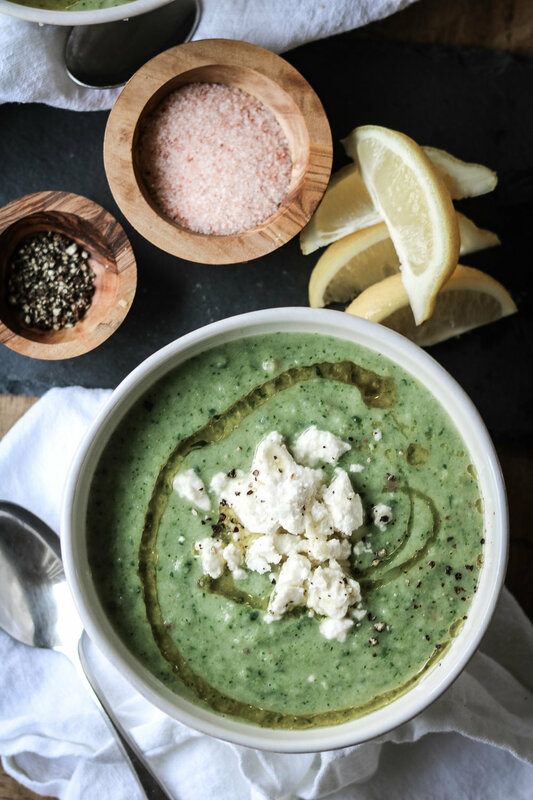 Here is a fresh take on a Spring soup from The Clever Cookbook by Emilie Raffa. I absolutely love the vibrant green color and the salty bite from the feta. In a large, heavy-bottom pot, warm the olive oil over medium heat. Sauce the onions, celery, and smashed garlic cloves until soft, about 5-7 minutes. Season with salt and pepper. Add the potatoes and give it a quick stir. Pour in the stock. Place the lip on top and bring the soup to a gentle boil. Reduce the heat to low and simmer (lid tilted) for about 10-15 minutes or until the potatoes are soft. Add the broccoli and cook briefly, about 3-4 minutes. Quick Tip: Be careful not to overcook the broccoli at this stage; the soup will turn yellowish-green (in term of flavor it’s not the end of the world; it just might look like swamp water). Working in batches (I used an immersion blender right in the pot) carefully puree the soup with the parsley leaves and feta. I like this soup rustic style, somewhere in between smooth and chunky. But the texture is up to you. Add additional stock or water if necessary. To serve, label the soup into bowls and sprinkle with extra feta crumbles, parsley leaves, and a drizzle of olive oil.